We interrupt our normal barbecue programming to focus on a beverage that’s indispensable to barbecue: bourbon. We add it to our sauces and marinades and spray it on ribs and pork shoulders. We certainly drink it at barbecues in the form of Manhattans, Old Fashioneds, Mint Juleps, Whiskey Smashes, and of course, straight up. Did you know September is National Bourbon Heritage Month? To celebrate we asked our colleague, Amy Stewart, author of one of our favorite new books, The Drunken Botanist (Algonquin), to debunk a common myth surrounding the origin of bourbon and share her recipe for a fabulous Bourbon Smash. Sips great with whatever you have on the smoker. There’s a myth about bourbon that I had a little fun debunking when I wrote The Drunken Botanist. The myth is that Thomas Jefferson promised 60 acres of fine Kentucky farmland to anyone who would plant a crop of corn. With such a powerful incentive, Kentucky was soon awash in corn, and then in corn whiskey, which means that one of the Founding Fathers practically invented bourbon. Right? Wrong. I called the librarians at the Kentucky Historical Society, who were all too happy to look up from the card catalog long enough to chat about bourbon. The truth is that the Virginia Land Law, which was passed a month before Jefferson became governor of that state, offered four hundred acres to anyone who could prove a claim. You could claim the land through military service, homesteading, and farming—and corn was only one of the crops you might plant to stake your claim. So much for Jefferson getting all the credit. But bourbon—which is distilled from a mash of at least 51% corn, by law—is a distinctly Southern invention, and that’s why it plays so well with barbecue. In addition to corn, a bourbon mash also contains barley, and either rye or wheat. Rye gives it a spicy bite, and wheat gives it that agreeably round, soft, smooth flavor we love about bread. Sounds like dinner, doesn’t it? And of course, bourbon is aged in a lightly charred American oak barrel, which makes it the perfect companion to anything grilled over a good fire. 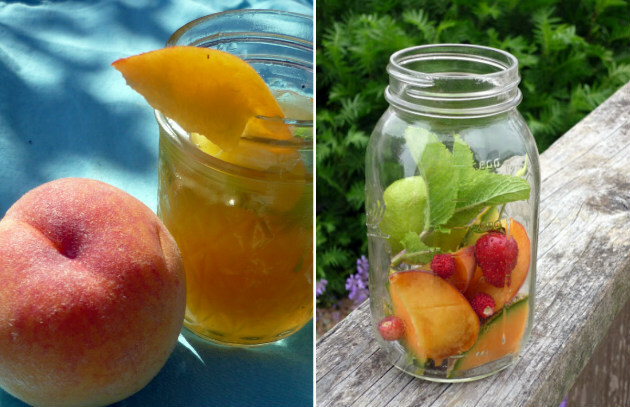 I think the best way to serve bourbon for dinner, particularly if you’re eating outdoors, is in a whiskey smash. A “smash” is nothing but a shot of some spirit, over ice, with a little sugar, mint (or some other herb) and fruit. The secret to a good smash is that you don’t strain out the fruit—you leave it in a happy mess in the bottom of the glass. Consider this a template for experimentation. Get the Bourbon Smash recipe. 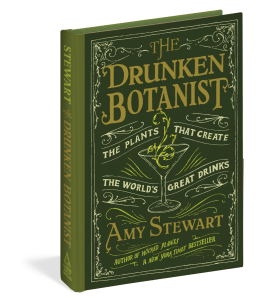 Amy Stewart is the author of The Drunken Botanist: The Plants That Create the World’s Great Drinks. You can find her at amystewart.com and on Twitter and Facebook.